Fish a la Veracruzana – Rick takes us to the Gulf Coast port of Veracruz, “The Mexican Mediterranean,” for a look at the city’s most famous contribution. Mojo and Escabeche – Mexican mainstays since the arrival of the Spanish: Slow-cooked garlic with smoky chipotles to spoon over shrimp; tangy light escabeche that’s the kind of fresh cooking that’s so popular today. Let’s Talk Tacos – Gleefully dispelling the notion that tacos are crispy shells jammed with ground beef and shredded lettuce, Rick takes us on a journey in search of the real thing. Sopes & Gorditas – Sopes (little masa boats) and Gorditas (plump little tortillas) are baked on a griddle and finished with all kinds of flavorful toppings. We watch them being created in a courtyard and market stalls in Mexico, as well as in Rick’s kitchen with a contemporary twist. Straight Cheese on Quesadillas – No one can resist a crusty grilled cheese sandwich, and Mexicans are no exception-only they replace bread with fresh corn tortillas. Whether you’re thinking of a spicy sauce or a saucy dance, the spirit of salsa comes together in an episode that explores Mexico’s lively blend of influences. Rick checks out Candela, a ?hot? salsa club in Oaxaca, watches the steamy Danzon dancers in a Sunday night in the plaza of Veracruz, and teaches us to ?tumbada?—not a dance, but a recipe that encourages ?throwing things together?—with the seafood specialty Arroz a la Tumbada. Rick also demonstrates how to make your own Salsa de Molcajete, and adapts the spirit of tumbada to Chicago with Spicy Jalapeño Beef Tips. With a little help from a vintage VW bus, Rick revisits the U.S.–Mexico cultural exchange of the 1960s and ‘70s, including the fast food that has resulted in some confusion over the years (did you know that it’s hard to find burritos in Mexico?) Side trips include an avocado farm in Veracruz and the dramatic Plaza of the Three Cultures in Mexico City. Back in his kitchen Rick turns viewers on to Salsa Verde Cruda with Roasted Tomatillos, a killerGuacamole recipe, and some experimental twists on the pizza and its Mexican cousin, the Huarache. Rick’s recipe for a great summer party brings together friends, family and a festive outdoor taco buffet. But if you’re thinking of tacos as standard fare, you haven’t tried Rick’s Tomato Chipotle Salsa, Pork Picadillo, or Tikin Xic Fish Tacos. Speaking of festive, Rick’s side trips include the wildly colorful Central de Abastos Market in Oaxaca for fiesta trinkets, a rural Mexican alebrijes workshop to watch the fantastical wood carvings being made, and a taco stall in Veracruz where you can sample tacos made of everything from pickled pigs feet to fried plantains. Definitely a full plate! Which comes first? The chicken or the egg? According to Rick, it doesn’t matter. Any time is right for your favorite comfort foods. This eye-opening episode focuses on breakfast, with some surprising insights into the “traditional” eating habits of Mexican and American cultures. From late night at Veracruz’s bustling La Parroquia cafeteria to a lazy morning breakfast at Oaxaca’s Camino Real Hotel, Rick gives us a taste of Mexico. Back in his Chicago kitchen, he shows just how far a simple egg can go with his recipes for Huevos Rancheros, Huevos a la Oaxaquena and Huevos Revueltos a la Mexicana, before scrambling things up with some improvisational egg ideas. 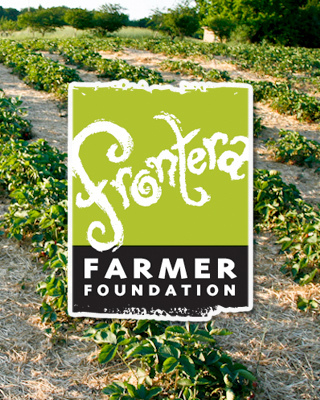 In this special episode Rick revisits his days growing up in his family’s Oklahoma City barbecue restaurant, recounts how his first visit to Mexico changed his life, and reveals how he blended influences in creating his world famous Frontera Grill in Chicago. Rick also traces the flame to a Cecina Tasajo stand in Oaxaca for some no-frills, coal-fired fast food and an upscale Yucatecan restaurant for a taste of the citrusy Poc Chuc style barbecue. From his home kitchen, Rick shows us how to make our own homemade Poc Chuc and then heads to the backyard for some slow-cooked Chile Glazed Pork Country Ribs. When Rick gets a craving for shrimp, it can lead anywhere. Down to the fish market in Veracruz for some of the freshest shrimp on Earth. Into Rick’s kitchen for his version of the beach favorite Chipotle Shrimp. Out to the backyard for a Shrimp Ceviche barbecue. And from his recipe for Guajillo-Sauced Shrimp with Quick Fried Cactus Rick takes off to a nopales plantation in Mexico for the amazing story of how a cactus-loving insect made Europeans see a whole new shade of red. Along with the lore, Rick provides some practical tips for selecting and preparing the prized shellfish. Rick looks at some of the special foods that every kid finds irresistible—and that adults never quite outgrow. From the familiar (quesadilla) to the unexpected (a Mexican pasta called fideos) Rick and daughter Lanie journey from marketplace to a family home in Oaxaca, exploring the role of children in Mexico along the way. In Chicago, Rick and Lanie work side by side to create their own favorite Sopa de Fideos, then team up for the delicious powdery cookies called Polverones. They also take a whack at a piñata, revealing a fascinating history behind the ancient tradition. Everyone knows they’re good for you. But in this episode Rick shows how vegetables can be surprisingly versatile, flavorful and fun. From the colorful Floating Gardens of Xochimilco, Rick traces the ancient practice of chinampas farming to the founding of modern Mexico City, uncovering some remarkably healthy secrets to the Mexican diet along the way. Then it’s back to Chicago to pick the best from Rick’s garden. Vegetables take center stage in the featured dishes as Rick shows us how to make a vegetable stew called Tinga de Calabacitas, a tomato-based Sopa Ranchero with Squash Blossoms, and a Crusty Chayote Casserole. Tropical Mexico holds the main ingredients for this show, including the amazingly versatile coconut palm. From tips on how a palm tree can be a castaway’s best friend, to the restorative powers of a coco de agua vendor, to a luxurious Coconut Pie recipe from the Yucatan, Rick gets inside the coconut like nobody else. Other sweet inspirations includeFrontera Grill’s famous Chocolate Pecan Pie. And for the perfect complement to dessert, Rick takes off to get some coffee, starting with a visit to a Mexican coffee plantation and ending on the beach for a very rustic cup of Café de Olla over a Veracruz campfire. 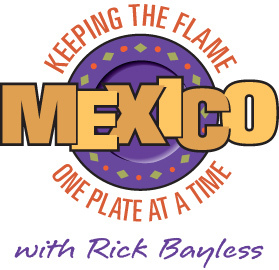 In an episode that celebrates the art of the dinner party, Rick shows how to host and cook with the sophisticated flare and unique flavor of Mexico. We follow Rick in a step by step guide to making mole, the hallowed “national dish” of Mexico, highlighting a menu of Whole Roast Pork Loin, Garlicky Braised Amaranth Greens and Potatoes, and Warm Cajeta Pudding. We also follow Rick as he explores the growing reputation of contemporary Mexican artists, shops the incredible Lagunilla Flea Market in Mexico City, and sample fine Mexican and imported wines at the Alipus wine shop in Oaxaca. Between their rich history, handcrafted flavor, and wide variety of fillings, tamales are one of the greatest special occasion foods in the world. Even the process of making tamales can be a party, called a tamalada. And in throwing their own tamalada, Rick and daughter Lanie create three distinctively different kinds of tamal: Spicy Mushroom Tamales in Corn Husks, a main course tamal roll called a Tamalon, and a modern variation on the rustic Zacahuil baked tamal. Along the way Rick demonstrates the sacred role of corn in pre-Hispanic Mexico as well as tips for getting good masa wherever you live. Rick shows how to throw a classy urban cocktail party with the openhearted warmth and unforgettable flavor of Mexico. Delectable antojitos like Jalapeño Rellenos, Plantain Empanadas and Pork Tinga Tostadas are only the beginning. Rick takes us shopping in Mexico City’s famous upscale neighborhood of San Angel for elegant Mexican accouterments, helps us compile a soundtrack of the best in Mexican music, and gets behind the bar at the Frontera Grill to reveal the recipe for the best margaritas in the world—as well as the mysterious origins of the margarita itself. A very cool show! Episode 13: Torta! Torta! Torta! If the idea of a delicious Mexican sandwich never occurred to you, than you’ve never had a torta. In this episode Rick shows how to make hearty Pork Tortas on Telera Bread and the more delicate meatless Tortas de Lenteja. Sandwiched in between is a game of Pelota Mixteca, an outing to the ancient ruins of Monte Alban, a stop at a Mexican tea salon, revelations on the role of Lent in the Mexican diet, and a surprising French connection. This episode shows that—like a hot dog at a ball game —sometimes the simplest things in life are the most satisfying.